The scientific name of these animals was chosen to honor the Brazilian tropical physician and zoologist Dr. Afrânio Do Amaral. 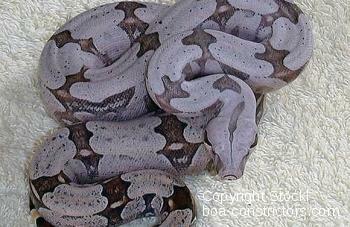 As the common name already suggests, the main characteristic of Boa c. amarali is an extremely short tail which sets it apart from any other subspecies of Boa constrictor. 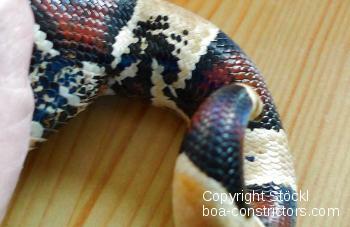 Like Boa c. constrictor, short-tailed boas frequently have bat-shaped saddle patches (‘widows’ peaks’). In many specimens, this ornamentation is developed even more precisely than in red-tailed boas. 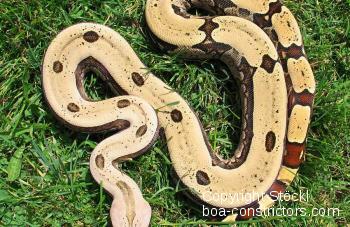 According to the latest research in which genetic testing was applied, Boa c. amarali can be considered as a local variant of Boa c. constrictor. However, this result hasn't been acknowledged by the official taxonomy yet. We doubt that it ever will be. However, it cannot be denied that Amaral’s boas, especially those from Bolivia and from the Pantanal, show a very close resemblance to Boa c. constrictor. More on this topic you can find on the "Bolivia" page (follow the link above). 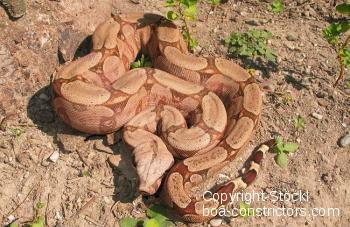 Two variations of Boa c. amarali are known: The South Brazilian Boa c. amarali with integrative bright- to dark-gray or –brown shade and the Bolivian Boa c. amarali, whose coloration is similar to those of the redtailed boas Both variations posses an extremely short tail (hence the denotation) and numerous black dorsal and lateral spots. The "widows peaks" are exremely long and distinctive. In Germany only the South Brazilian amaralis are actually wellknown, and even those are not frequently found here. Specimens from Boliva have been bred only two times in Germany so far (we were the ones who bred them, by the way :o). Only a few of them are kept in captivity in Europe.